(12 photos) I had a chance to make yet another quick visit to New York City in mid-November. 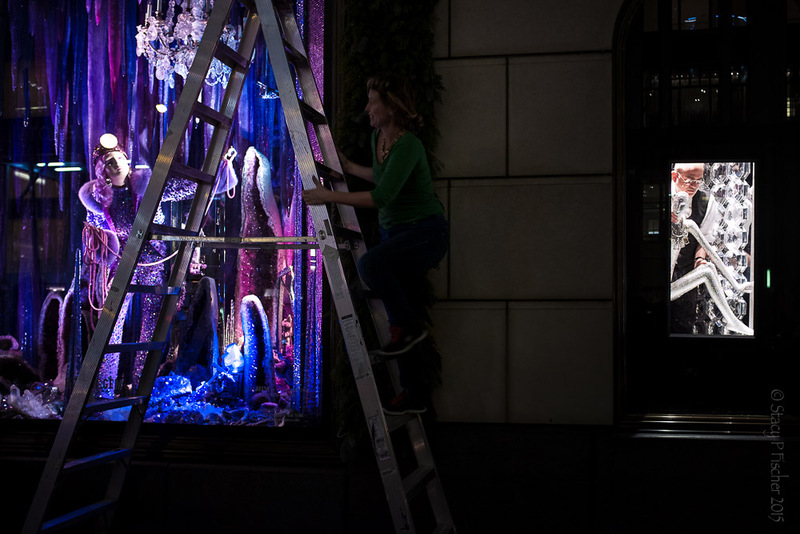 Like the rest of America, the city had already begun decorating for Christmas. 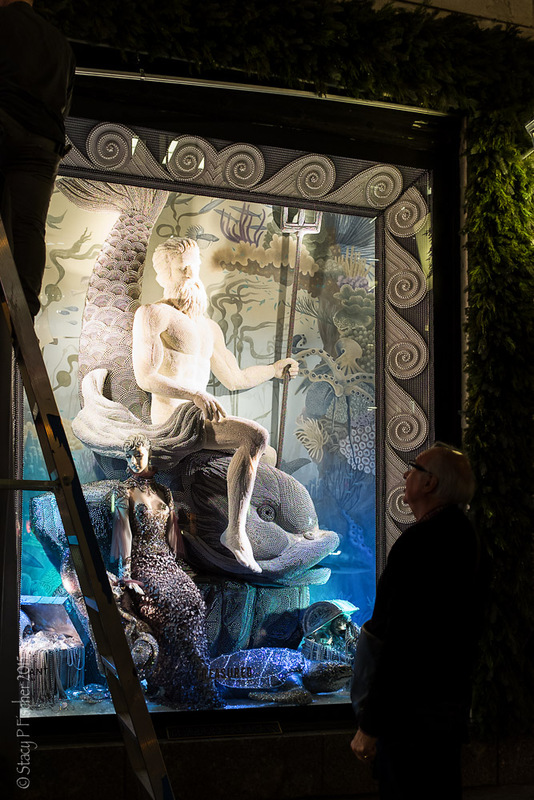 One of the must-do activities at Christmas is to stroll along Fifth Avenue from 59th Street to Macy’s at 34th Street to see the beautifully decorated holiday-themed department store windows and to visit Rockefeller Center with its enormous Christmas tree. This is not as easy as it sounds, as the sidewalks are jam-packed, with very little room to maneuver easily. Don’t believe me? Take a look at this image from last year when I was crazy enough to visit the city ten days before Christmas! But I digress. 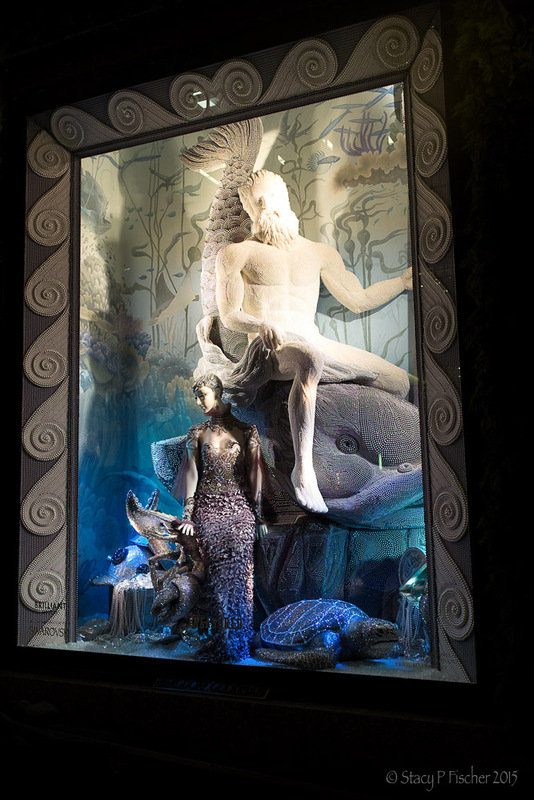 This year, my visit was 10 days before Thanksgiving and my husband and I comfortably strolled down Fifth Avenue. 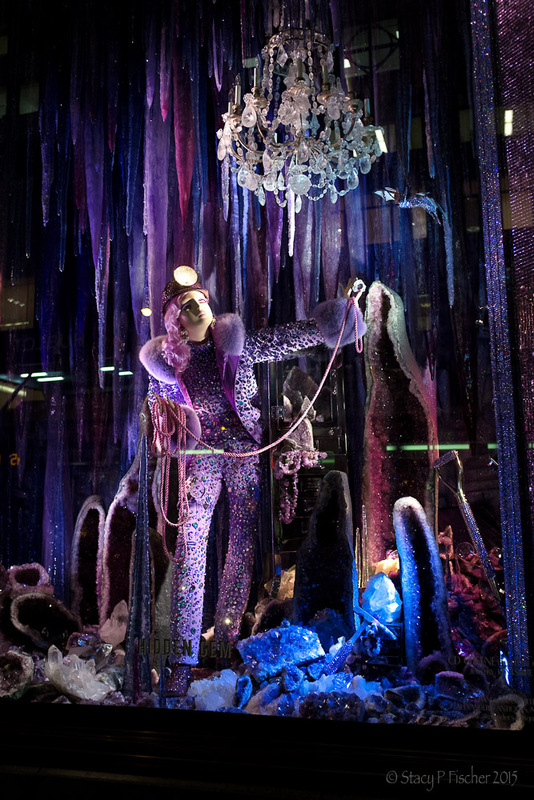 We were window shopping and enjoying some of the early holiday decorations that were up in anticipation of the crowds arriving for the upcoming Macy’s Thanksgiving Day Parade. 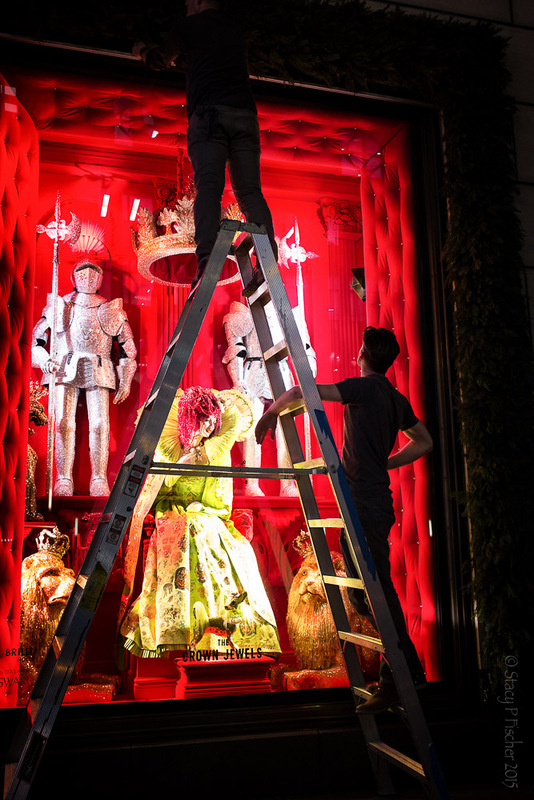 I, of course, had my camera in hand, when I spied this couple peeking underneath the curtain shielding one of Bergdorf Goodman’s windows, emblazoned with the message “Holiday Windows Debut November 17.” I stopped in my tracks, chuckling as I shot this photo. 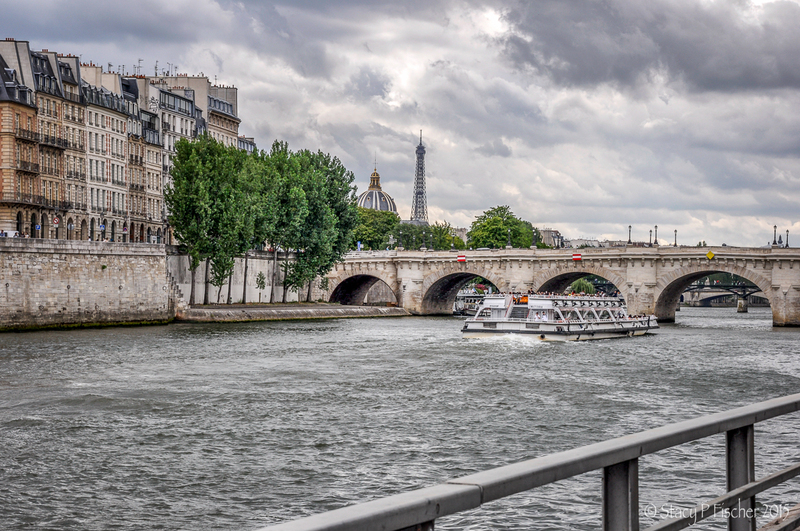 I envied the couple their boldness, especially since we were leaving the city on the 17th and would miss the event. 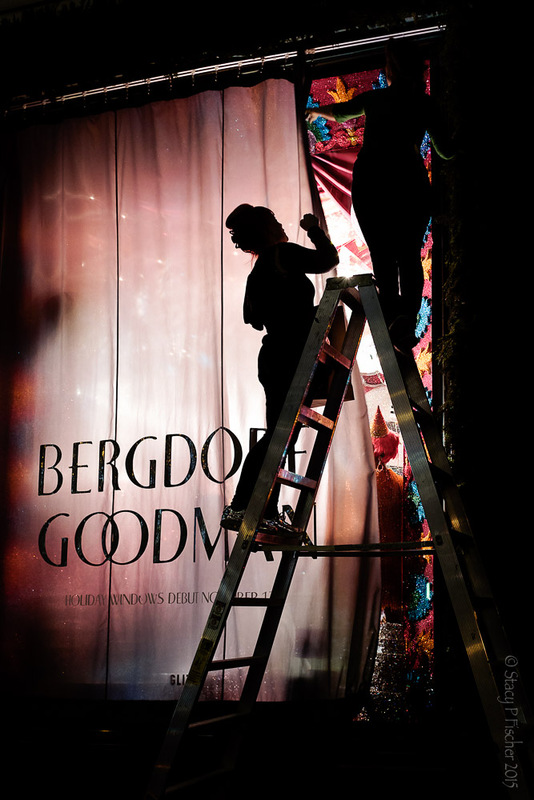 So, imagine my surprise the next evening (November 16) when, once again, I was walking up Fifth Avenue and saw three teams of Bergdorf employees removing the curtains from the windows! I have no idea why they were “debuting” the windows a day early, but talk about being at the right place at the right time! The unveiling took others on the sidewalk by surprise too, and we all felt giddy being the first ones to view the beautiful windows. 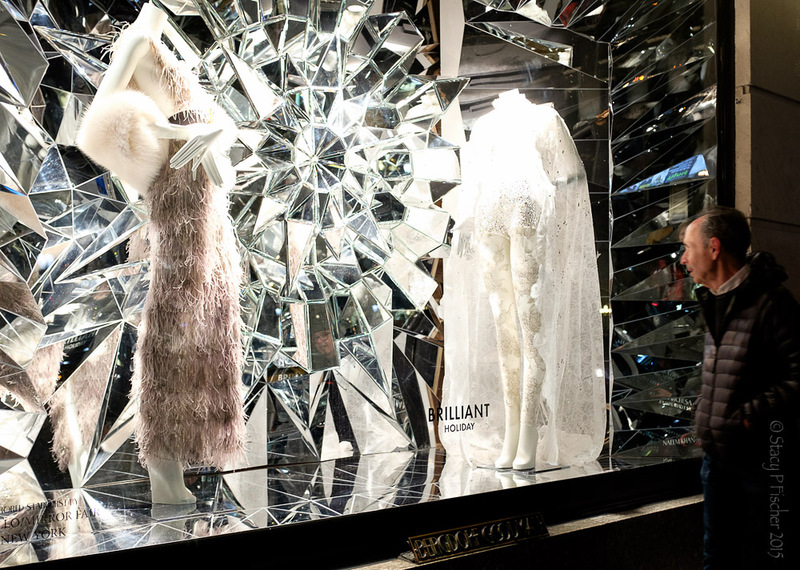 I have since learned that “Brilliant Holiday” is the theme of Bergdorf’s annual window display and that it incorporates millions of Swarovski crystals (which I can attest to). Hope you enjoyed seeing these windows as much as I did! 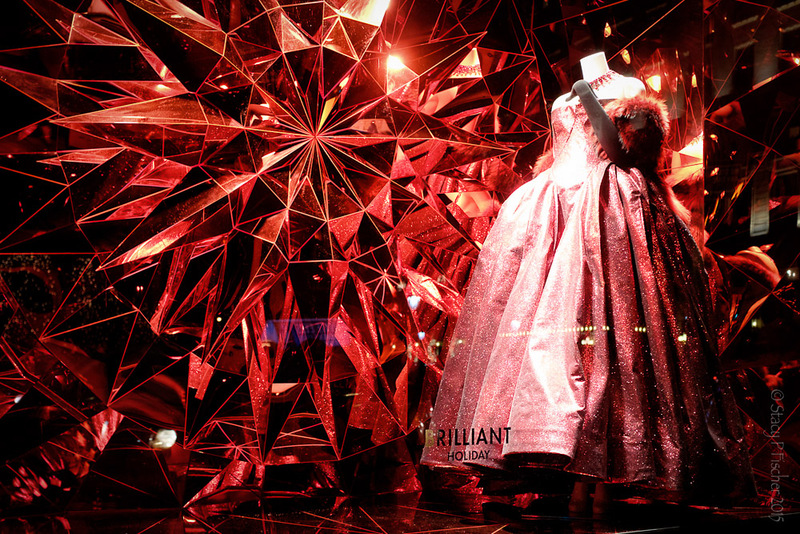 This entry was posted in Art, New York City, Places and tagged Christmas, Fuji X100T, Manhattan, photography, postaday. Bookmark the permalink. ← Alcatraz Island: Welcome to Broadway! Fantastic. I love that red window. Stacy ~ these photos are gorgeous! So bright and colorful. Wishing you a Happy New Year and lots of fun adventures in 2016! Thanks so much, Patti! I can only take credit for pressing the shutter – the designers created the gorgeousness 🙂 Happy New Year to you too! Oh my gosh what fun!!! 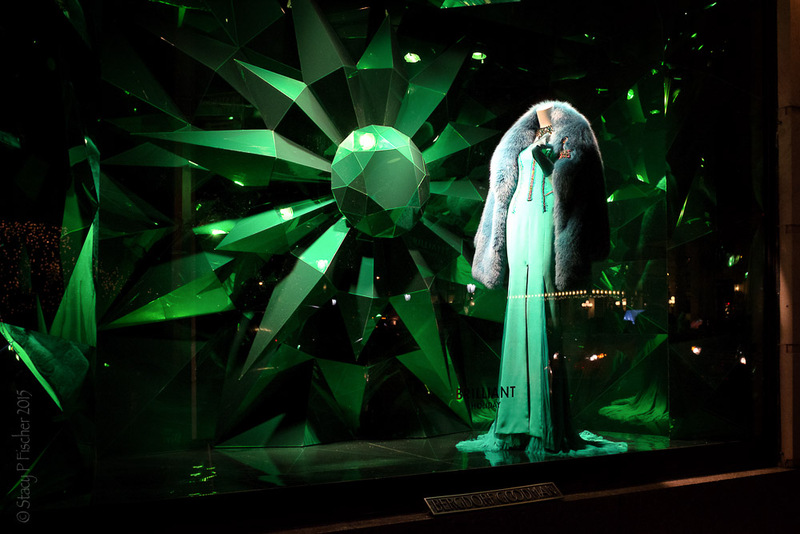 I love looking at window dressing, always have. Great photos and wonderful luck. I’m so glad you had another trip to New York. Merry Christmas! I am swooning over these pictures! AND YOU GOT TO SEE THEM! Unveiled never the less! Oh what a joy they must have been to see. THANK YOU for sharing these awesome captures. Thank YOU, Nancy, for being so excited to see them 🙂 As evidenced by my January reply to your December comment, my holiday blogging hiatus has extended a bit longer than I had anticipated. Oops! Hope all is well with you! Doing just fine… and I am so glad you are back! Brilliant windows. Is that what they call a window of opportunity ? What a brilliant surprise Stacy and so much fun to be there catching the big debut. Spectacular shots! 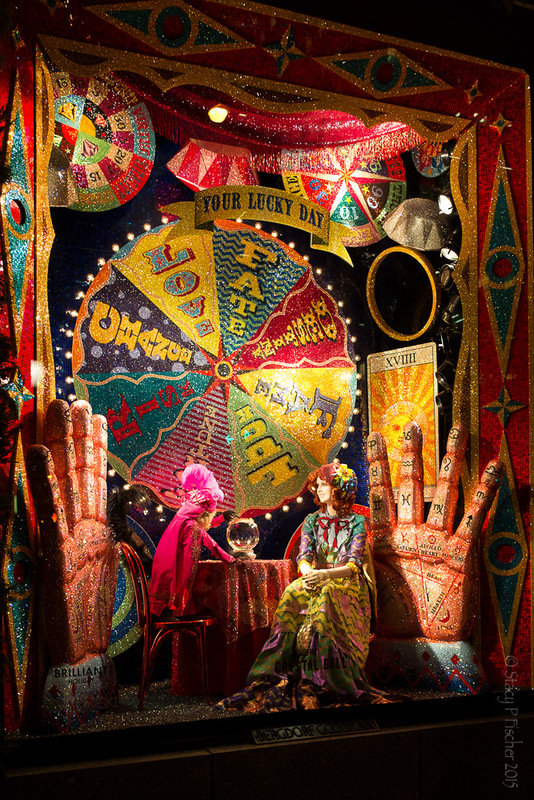 This is a delightful tour of Bergdorf’s windows…my fave is The Crystal Ball, all that glitz…I bet the reading that day was wondrously bright and hopeful! I have yet to see our famous Myer windows in the Bourke Street Mall, but, today, the queuing was quite long, as usual, and that’s saying something considering the heat was in the early 40s celsius! Will view and take pix once things calm down. Lovely post, Stacy! Thanks for your lovely comment, Janina. 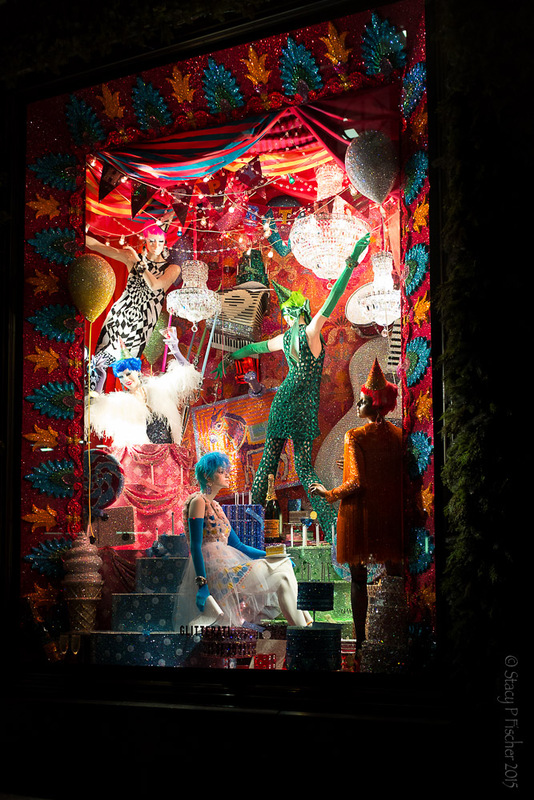 Google-ing Myer’s Christmas windows…WOW…even I haven’t done that! Which year did you get in the images? Unfortunately, I may pass the place frequently, but have yet to see the windows…the queues are still quite long! As to the rest of Christmas, when I saw the city only a few days later, most of the good decorations had gone! Geez…I must say the spirit wasn’t there this year! At least, I’ve not felt it. I think it must be all the nastiness that went on in 2015…sometimes too much news is not good for you! Cheers, Stacy! Look forward to more posts. Saw this year’s windows and some from previous years as well, so if you ended up missing them, visit virtually 🙂 Cheers to you to, Janina! Thank heavens you were there! I have heard of these windows but never really seen more than a blurry reflecting shot of them. Aren’t they absolutely magnificent!! What clever stylists they employ!! I’m pretty sure I would’ve peeked under the curtain! But really excited for you to happen upon the early unveil! Haha! I’m not sure I would have had the courage to, but it sure was incredible fun to spy someone who did 😀 Thanks, Tree! Hahaha! I think it will turn out to be a once-in-a-lifetime experience, Joanne 😀 It’s fascinating to witness creativity in all its wondrous forms, isn’t it?